Director: Tony Giglio. Producer: Michael Z. Gordon. "Fast pace, high emotions, and patriotic innocence. Excellent!" The Columbia Review. There can never be too many U-boat movies. 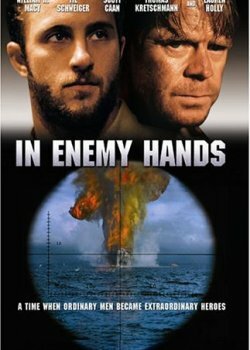 If this is how you feel, then “In Enemy Hands” is a movie you’ll enjoy. An original and clever plot, credible characters, and good action. This is a WWII movie, and it reflects the pace, emotions, and a lot of the patriotic innocence of that era. William Macy delivers a stellar performance, and the German captain (and his deputy) are excellent, especially in balancing the conflicting pressures they are facing. And lastly, as in every historical movie, there are plenty of opportunities for silly nitpicking by industrious Monday morning critiques, who are actually wrong most of the time. “In Enemy Hands” does a wonderful job at creating an authentic, intense experience for the viewer. It’s a great movie. Enjoy!